I stopped wearing my wedding ring a few of weeks ago because my fingers swell throughout the day and make it feel uncomfortable, which leads me to take it off, set it down somewhere or put it in a pocket, and then forget where I’ve left it. Not good. But I really dislike not having it on when I leave the house in the morning. I love my wedding ring and all that it symbolizes. I feel like there is a piece of me missing when I don’t have it on. So I knew I had to figure out a way to wear it, even if it isn’t on my finger. The obvious choice was to put in on a chain and wear it around my neck. And I did that for a few days. But it seemed incomplete. So I decided to put my skills as a jewelry artist to good use and make it feel more like an intentional necklace. 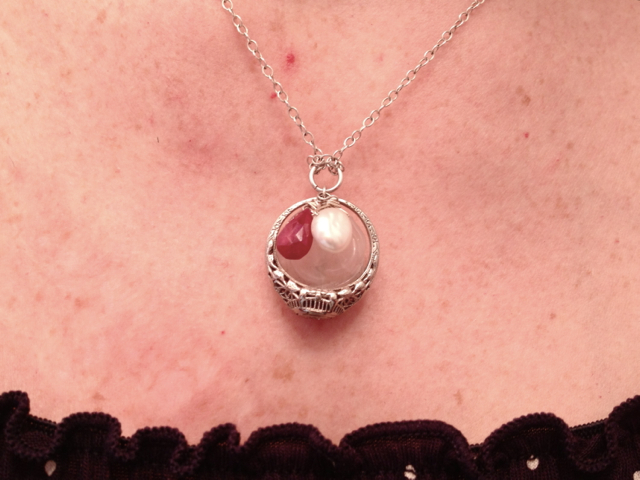 I rummaged through my drawers of beautiful stones and picked out a white keishi pearl to represent Zakk, who was born in June, and a ruby droplet to represent our daughter, who is supposedly going to be born in July. These felt like the perfect choices, but I couldn’t decide how to attach them and get them to lay nicely when wearing the necklace. Then I found a rosette carved from rose quartz that fit perfectly into the center of the ring. And rose quartz is my birthstone. Opal, too. And I love opal. But I didn’t have any. So the rosette was meant to be. And here’s how it all came together. I love wearing my wedding ring in it’s new and very meaningful setting. I kept staring at it at book group- beautiful!! It is so BEAUTIFUL, just like you and I’m sure my granddaughter will be when I finally get to meet her!